GM Arkadij Naiditsch achieved a convincing victory at the 15th International Neckar Open. He scored the amazing 8,5/9, finishing a full point ahead of GM Arik Braun and GM David Baramidze. In the group of players with 7,0/9 we find the winner of Cappelle La Grande GM Grzegorz Gajewski, as well as the Hungarian talents Viktor Erdös and Peter Prohaszka, as well as many renowened players. The women’s first prize went to Joanna Majdan-Gajewska, who clinched an important victory in the last round. More than 400 participants played the A group and total of 753 participants in the festival. The victory of Naiditsch confirms his status as the number one player in Germany and guaranteed him the title and the 3000 eur winner’s check from the prize fund. Starting with the May rating list GM Arkadij Naiditsch will be with his highest ever ELO – 2701 points. This ELO includes the EICC and the Bundesliga games, Neckar finished just 5 days before the rating list and if included the ELO of Naiditsch will be 2716. 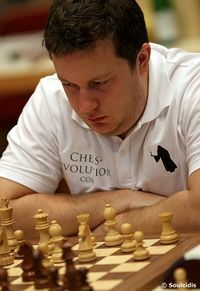 In the same month of May he will be commenting the Candidates Matches 2011 live on Chessdom.com together with GM Bacrot and the Chess Evolution team.